Microsoft has opened up the web version of Skype to anyone in the United States and United Kingdom, though full Chromebook support is still lacking. Skype is making it easier for users to ditch their desktop software, and use the Skype for Web beta instead. 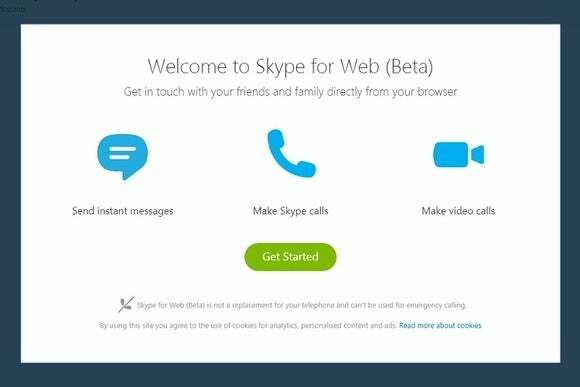 Skype for Web, which launched as a closed beta last fall, is now available as an open beta to all U.S. and U.K. users. It's similar to the desktop version, with support for messaging, audio calls, and video chats. You can also search your contact list to start new messages, or find new contacts by searching the Skype directory. It supports desktop notifications as well. There are some differences from the desktop client, however. The web version doesn't have nearly as many options for sorting and managing your contact lists, and there doesn't seem to be any way to change your “mood.” Still, as a simple way to connect with your existing Skype contacts, it should get the job done. Setting up the web version of Skype does involve installing a plug-in if you want to conduct voice or video calls. For now, that means Chromebook users are limited to text messaging only. Skype has said that it's working on a WebRTC version of the web app, which wouldn't require a plug-in and would technically allow for Chromebook support, but there's no word on when that might happen. Also worth noting is that the web version doesn't support Microsoft's Edge browser in the latest Insider build of Windows 10. One more caveat: By using the app, you automatically agree to the use of tracking cookies for “analytics, personalized content, and ads,” according to a notice at the top of the screen. This is standard procedure on the web --and Skype's desktop app shows ads as well--but it's something to be aware of.